I'm halfway through Laurent Fignon's autobio - We Were Young and Carefree. I first started watching the Tour in 1989 and was excited to be able to "talk the tour" with a couple of racers in the office. Fignon seemed like kind of a jerk, but he seemed less of a jerk than LeMond, so I rooted for Laurent. the 89 ended with a time trail and this was the year that LeMond rolled up to the starting ramp with a bike sporting a pair of rule stretching traithlon-style handlebars. 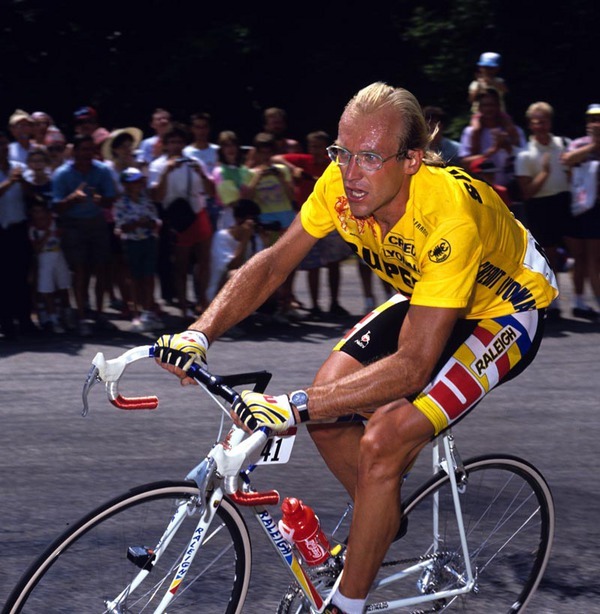 He made up nearly a minute on Fignon and won the Tour by eight seconds. In his book Fignon refers to LeMond and one of cycling's great followers. Ouch. The book is full of excuses and pages of how so and so done him wrong, but it's a good read. I particularly liked this passage, seems pressient for today's "video kids:"
And when I got on my bike, the call of the wild infected me with blasts of emotion. I had the feeling that I cold conquer anything, and I would, even though I didn’t know how or why; I would be dragged along merely by the yearning for it, like an explorer in new territory. Our minds were probably less restrained than those of our children. Living in virtual worlds has become their daily bread. As for us, the state on things meant that we were rooted in real life. And that is the magic of cycling: the simple forward motion from the power in your legs treats you to great bursts of freedom. Your legs and nothing more. That’s the little miracle that is the bike, where man and machine conjoin. It’s a unique invention. The union of a man with himself.